Bush Turf and crews work to repair the Field of Dreams in Dyersville after an act of vandalism left it in disrepair. Staff members from the Quad-Cities River Bandits and Clinton LumberKings as well as a crew from Milan-based Bush Sports Turf worked Monday to help bring the “Dreams’’ to life again. 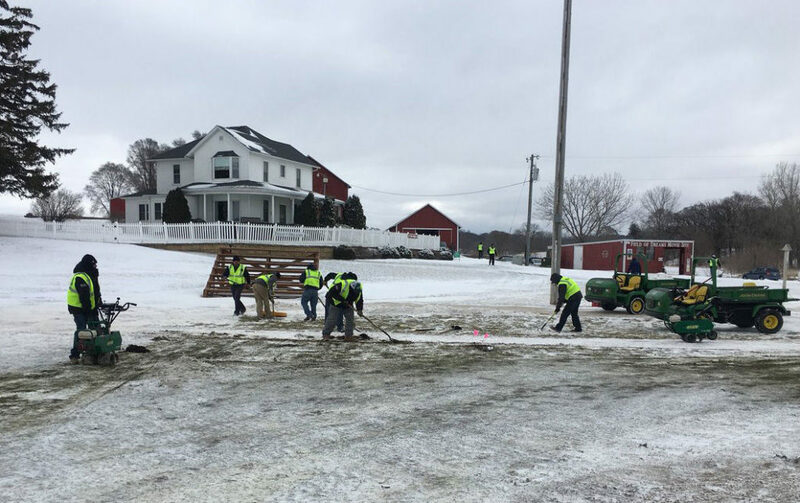 Through a cooperative effort organized by Minor League Baseball, they joined representatives from two other Iowa minor-league baseball teams in helping repair the playing surface at the Field of Dreams site near Dyersville, Iowa. Marking was among more than 50 volunteers who spent Monday removing old grass, realigning a new diamond and rebuilding a damaged pitcher’s mound before new sod was laid to create a new infield and sidelines. Crews will complete the project by installing a new infield surface over the next few days. Marking was joined by Clinton LumberKings groundskeeper Reid Olson, Quad-Cities general manager Andrew Chesser and assistant general manager Jaqueline Holm in volunteering on the project. Front-office personnel from the Cedar Rapids Kernels, a five-member crew from the Iowa Cubs Sports Turf subsidiary and around a dozen workers from Bush Sports Turf and the baseball team from Iowa Wesleyan University assisted on the project. Jeff Lantz, an Iowa City native and the senior director of communications for Minor League Baseball, organized the effort which was originally scheduled to take place last month but was postponed three times because of lingering winter weather. Lantz said Steve Bush and his Bush Sports Turf company provided much of the equipment needed to rebuild the field. From a sod cutter to a laser grader and equipment needed to reposition the pitcher’s mound and home plate, the equipment and the people to operate it were provided. Despite a couple of inches of fresh snow, the work started at 9 a.m. as scheduled and continued throughout the day. The work started with using a leaf blower to remove snow from the diamond before the real work began. “There are a lot of people involved and it’s a project that will get this field back in good shape, which is good for everybody,’’ Chesser said. Chesser views the project as an extension of the River Bandits’ community involvement. “The River Bandits’ reach extends beyond the Quad-Cities and whether the need is in the Quad-Cities, Geneseo, Muscatine or Dyersville, we’re willing to pitch in if we can,’’ Chesser said. LumberKings general manager Ted Tornow said visitors to the Field of Dreams site frequently make their way to Midwest League games in the region as well.